Alex was born and raised in Portland, Oregon and moved to New Mexico in 2010. Over the last eight years, he has conducted molecular biology research resulting in several peer reviewed publications. He received a Bachelors degree in Biology from the University of New Mexico in 2014 and completed the requirements for an M.B.A in 2018. Currently, he is pursuing a Ph.D. in Biomedical Science at UNM, using CRISPR-based gene editing to identify genes involved in cancer development. Alex joined EquiSeq in 2018 because of his interest in biotechnology management. He learned more in his first six months at EquiSeq than in two years in the M.B.A. program at the University of New Mexico. 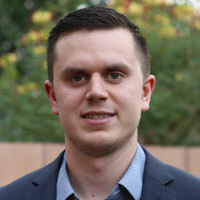 He is excited to be a part of the Albuquerque startup community, and to be working with EquiSeq's strategic partners. In his free time, Alex enjoys spending time with his wife, traveling around the world, and exploring New Mexico. You'd be surprised to learn that ... Although Alex spent the first 18 years of his life living in Oregon, he absolutely hates the rain.